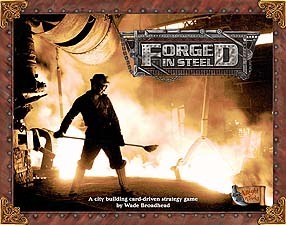 Forged In Steel is an innovative card driven strategy city building game for 2-4 players. Take the role of a turn of the century entrepreneur and attempt to dominate commercial, mining, industrial, and residential development. During your adventure you will become a miner, mill worker, magnate, or maybe even the mayor as you fight to develop a beautiful and prosperous Colorado city once dubbed "Pittsburgh of the West". CREATE A UNIQUE STORY with innovative card driven game play, use cards for Municipal Muscle (MM) action points, for historic events, or as big picture headlines that change game play: NO TWO GAMES ARE EVER THE SAME. DESTROY your opponents' hard work with disasters, labour unrest, riots, mafia, hired guns and thugs, and with the devastating floods. EXPLORE AMERICAN HISTORY through the industrial revolution and Progressive Era, experience history or rewrite it with historically accurate cards and themes from 1890-1910 America and Colorado. Every turn immigrants arrive to seek jobs, but if they have no place to stay then watch out for a riot! STRATEGIZE by balancing short term plans with long term goals in the unique card banking and selection mechanism. You can prepare a game-spanning strategy, but do not be afraid to adapt to an ever-changing city. ENJOY THE FUN, the tension, and the many delicious decisions created from a revolutionary interactive game system where YOU and your friends balance the game.